Cancer Care Association Sri Lanka AGM 2016. The AGM of the Cancer Care Association Sri Lanka, was held on 11th June 2016 at Committee Room E of BMICH. The event was decorated with many noble and guests and members of the CCASL. The audited financial report for the year 2015/2016, the progress report for the year 2015/2016 and the theme song of the CCASL was presented during this event. The event concluded with the subsequent appointment of the new committee for 2016/2017. Cancer Care Association Sri Lanka held its first ever stall at Visaka Avurudu Pola on April 2nd 2016. It was an immense success where we were able raise funds to full fill the spiritual, nutritional and medicinal needs of the needy cancer patients of Sri Lanka and also to raise awareness about cancer care and palliative care activities conducted by CCASL, among the general public. The stall was conducted under the theme of eradicating cancer via healthy food habits. Hence, items such as organic traditional rice varieties, spices, homemade food and drink were the mainstay at the event. It was a fun filled event and our volunteers were seen having fun and enjoying it to the fullest while working their hearts out to raise funds and raise awarness for this worthy cause. “Thāla Suwathā (තාල සුවතා)”, the Annual Event of the Cancer Care Association Sri lanka will be held at the at the Bishop’s College Auditorium, on Saturday, the 26th September at 6.30p.m. The event consists of rare and traditional dancing, drumming and performing arts items by the renowned Ravibandu Samanthi Dance Academy. The funds collected will be fully utilized for the welfare of the cancer patients through many projects in the form of donation of drugs, donation of breast prosthesis, Hospice & and Home Based Palliative Care and the spiritual development of cancer patients. We cordially invite all who are in search of merits to join hands with us for this noble cause, to feel the beat of drums and the rhythmic vibes to heal countless hearts !!! 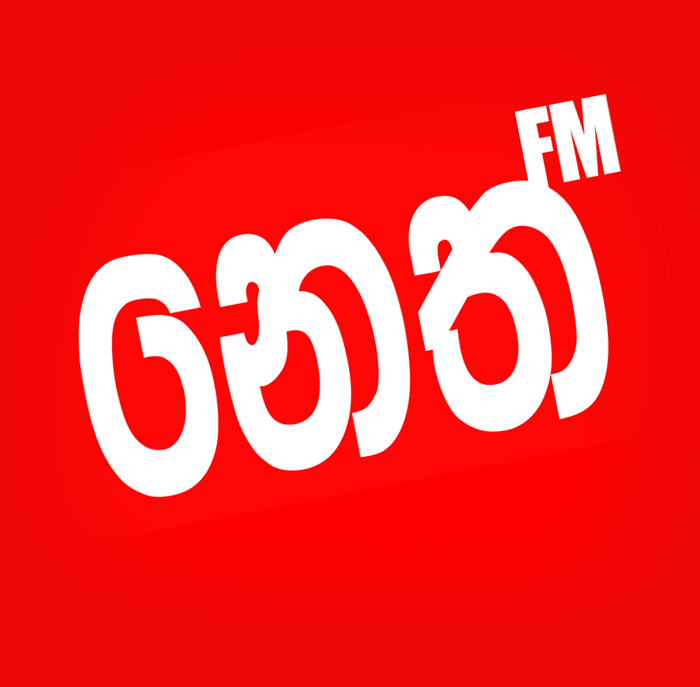 Tickets Available at – Sarasavi Bookshop, Nugegoda. Please Contact – 071 472 1588, 077 267 87160, 0778763782 for more information. CoBRA is a comprehensive congress dealing with controversial issues in aspects of breast cancer care, with presentations, debates and discussions. Discuss controversial issues in a critical manner; to be the leading forum for opinion leaders, clinicians and industry; reach the best clinical recommendations for therapeutic dilemmas. Controversial topics and debates; cohesive and integrative sessions; reaching consensus where possible; internationally prominent speakers and opinion leaders. Please visit the below link for more information. 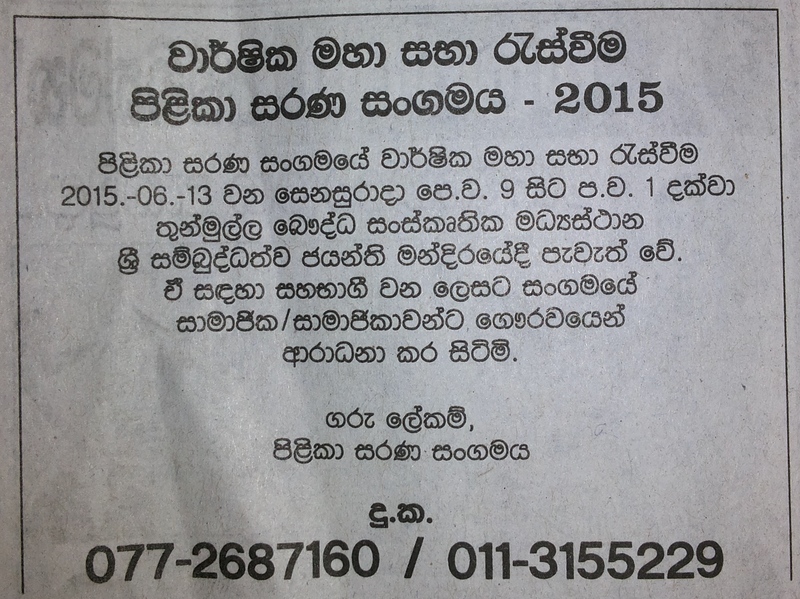 The Annual General Meeting of the Cancer Care Association Sri lanka will be held on 13th June 2015 at the Buddhist Cultural Center – Sambuddhathwa Jayanthi Mandiraya, Colombo 03 , from 9.00 a.m to 1.00 p.m.
All members of the organization are cordially invited to participate and actively contribute to the journey of our organization, in our quest to make the lives of the Sri Lankan cancer patients, happy and pain free. A summery of a another successful and eventful year, where we at CCASL, was able to work our hearts out for the betterment of the underprivileged cancer patients in Sri Lanka. I take this opportunity to thank all our well wishers and Volunteers, the two strongest pillars behind this success. Cancer Care Association Sri Lanka. 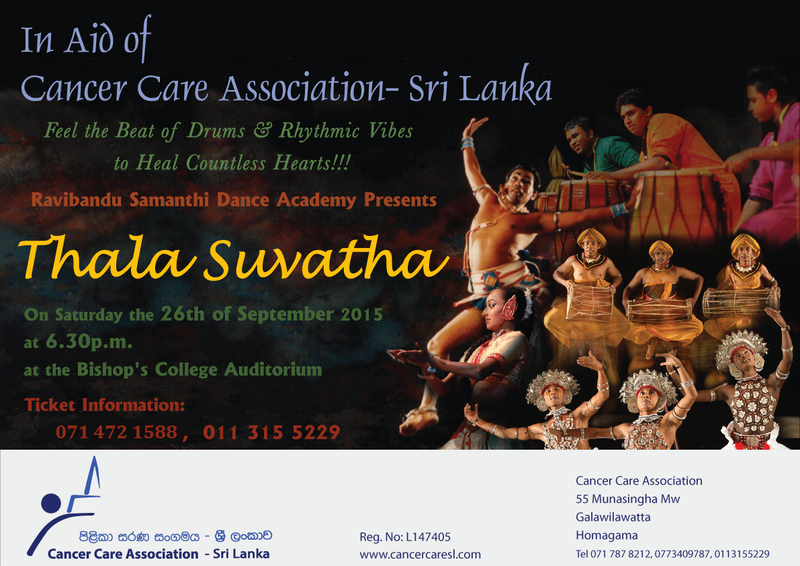 “Maname” Stage Drama – In aid of Cancer Care Association Sri Lanka. 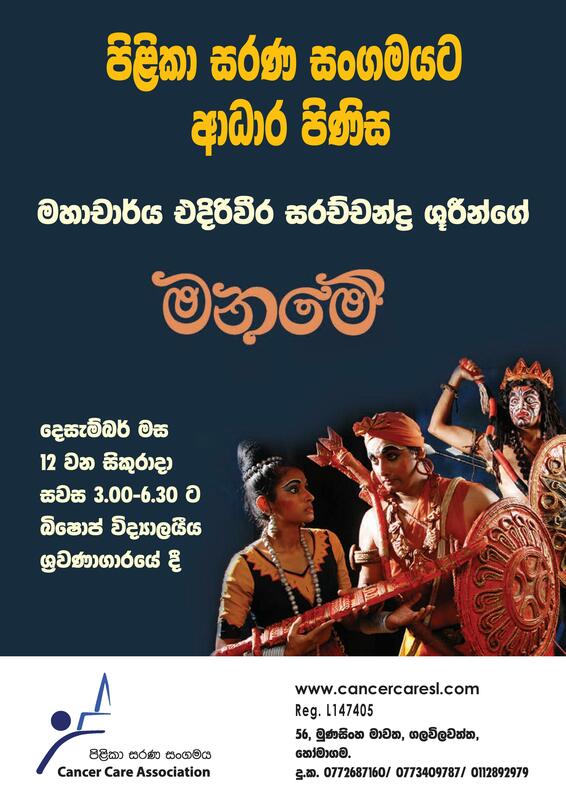 The Cancer Care Association Sri lanka (CCASL) will be presenting ‘Maname’ a Sinhala stage drama on December 12th 2014 at 3.00pm and 6.30p.m. at the Bishops College Auditorium, as its annual fund raising event. The funds raised from this event will go directly for the enrichment of the lives of people affected by cancer, via our many projects such as the Chemotherapy Drug Project, Cancer Care Hospice Project, Breast Prosthesis Project and Home Based Palliative Care Project. Hence we cordially invite all in search of merits to participate in this event and help us to make the lives of the Sri Lankan cancer patients, happy and pain free. Tickets will also be available at Sadeepa Bookshop Borella, Sarasavi Bookshop Nugegoda, Mitsala Textiles Maharagama and Bishops College auditorium gate on the 12th. Cancer Care Association Sri Lanka (CCASL). Bodhi Pooja at Paragoda Temple, Gall. Bodhi Pooja at the Paragoda Temple, Galle @4p.m today. Organized by Cancer Care Association, Karapitiya Branch, for the spiritual well being of the patients at the Karapitiya Cancer Unit. All in search of Merits are welcome.